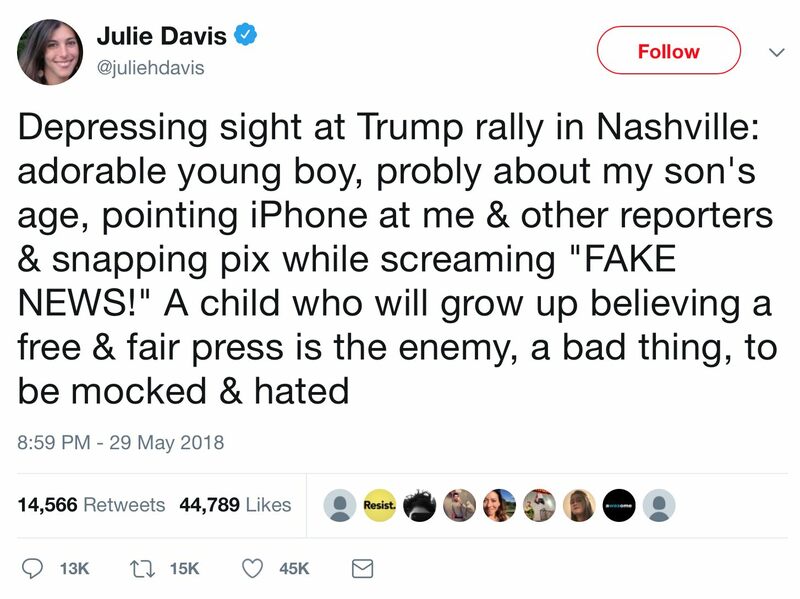 Tuesday evening (for Wednesday’s print edition), New York Times reporter Julie Hirschfeld Davis, covering President Donald Trump’s rally in Nashville, Tennessee, reported that it attracted “about 1,000″ attendees. 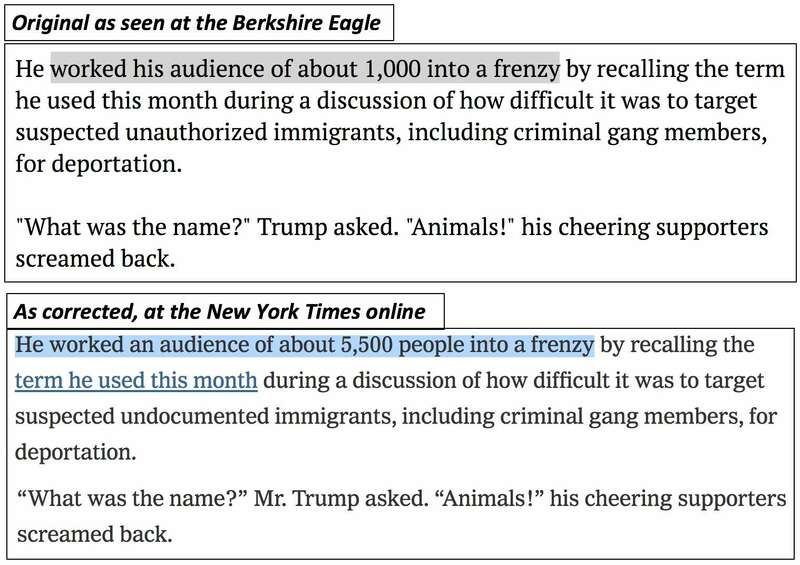 The Times issued a correction on Wednesday, stating that “the fire marshal’s office estimated that approximately 5,500 people attended the rally.” So the crowd was 5-1/2 times larger than originally reported. How can that happen? Since the press is falsely claiming that the Trump administration’ Department of Health and Human Services “lost” track of almost 1,500 immigrant children, it seems fair to ask how Davis missed counting 4,500 people in front of her face. In the original and corrected instances, Davis seemed to want readers to believe that Trump’s supporters constituted an unruly, nearly out-of-control mob. Davis is clearly intent on perpetuating the false impression she helped create two weeks ago that Trump was referring to all undocumented immigrants with his “animals” comment earlier this month, when he was obviously referring only to MS-13 and other criminal gang members. The dishonest presentation seen above, apart from her pathetic crowd-size error, demonstrates why Trump, his followers, and anyone of anyone political persuasion who just wants to see fair and honest reporting so detest the establishment press’s current pattern of conduct. President Trump blasted the Times’s original estimate in a Wednesday morning tweet. In regards to Davis’s reporting from Nashville, the shoe definitely fits. If this “adorable young boy” grows up believing that a dishonest or even careless press “is the enemy, and a bad thing to be mocked” and despised, that will be a very good thing. Julie Davis should spare us the crocodile tears and concentrate her mental energies, such as they are, on doing her darned job properly.